Taking a step away from our namesake, once a year we craft a lager worthy of extra days in the cellar. 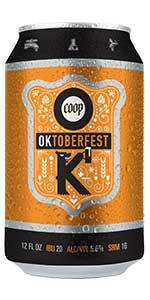 The COOP Oktoberfest combines Munich malt, Bavarian hops and a traditional German yeast, and calls for the celebration of fall's arrival. It's time to find a tent, fill your stein, prost, yodel and polka! Taste: Malt up front, a little wheaty. Light notes of fall spice. Coop's Oktoberfest is pretty typical of the amber end of the style, malty and moderately sweet. Have had on tap as well, which was a little stronger in flavor. Not bad at all. Pours a clear darker golden color with off-white head. Malt, bread, hay, cereal, and some grass on the nose; follows onto the palate. Medium bodied. Finishes with more malty goodness. First had this Oktoberfest poured from 12-oz. can, purchased in Norman, Okla., into faceted mug. Nice color, COOP's Oktoberfest lager is also fairly true to style. Poured out a clear, amber color with some reddish highlights. It smelled floral and grassy. Lots of sweet malty notes, too. It was very spicy and had a nice sweet caramel malt flavor. It was soft and smooth with a dry finish. This stuff is best within about 30 seconds of the pour. Very thin head which dissipates quickly to nothing. Almost no nose at all. Looks nice though - pretty copper color. The real problem is simply the taste. To me its almost on the border of being rancid. I've purchased this two years going now, and both 6 packs were alike. Its just not a great beer, not a good example of an Martzen and not good with anything. Very flat feel. It is drinkable, but I don't think I will repeat.